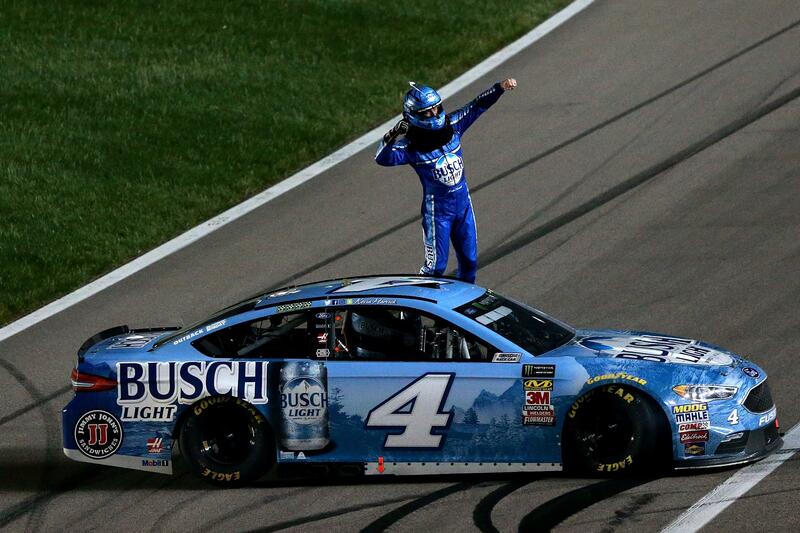 Kevin Harvick tracked down Martin Truex Jr. and passed him with just one lap to go on Saturday night to win the KC Masterpiece 400 at Kansas Speedway. The win was the second consecutive victory for Harvick, and his fifth checkered flag of the season. That already matches the most victories in a single season in his career, a mark Harvick set in 2006 and again in his championship 2014 season. While most of the race was run clean, the final 30 laps saw multiple stoppages. The biggest wreck came with just 14 laps remaining, as William Byron�s No. 24 Chevrolet nosed into the outside wall, landing on the roof of Ryan Newman�s No. 31. Several other cars suffered various degrees of damage as they tried to avoid the wreckage, including Clint Bowyer, Jamie McMurray, Ty Dillon, Chris Buescher and Matt Kenseth, who was taking part in his first race of the season. Coming out of that final red flag, Truex managed to restart in the lead and build an advantage over the field. But Harvick was able to quickly put himself back in second place, then consistently made up ground until managing to pass Truex with one lap remaining. Truex, the defending NASCAR Cup Series champion, gave full credit to Harvick and his team for establishing themselves as the team to beat this season. Joey Logano finished third, with Kyle Larson and Denny Hamlin rounding out the top five. Kyle Busch, who finished in 10th place on Saturday, remains the NASCAR Cup Series leader. Busch is 12 points ahead of Logano and 19 ahead of Harvick, with the rest of the field being over 100 points back. While Busch drives a Toyota, the next five drivers in the standings all ride Fords, and Fords have won seven of the first 12 races this year. �It�s pretty evident that the Fords have an unfair advantage this year,� Truex joked after the race, prompting Harvick to reply that the defending champion might have forgotten about last season, when it was Toyota who appeared to be unfairly ahead of the pack. Picking up another win only served to solidify Harvick as the favorite to win this year�s NASCAR Cup Series championship. Harvick is now the 11/4 pick to win this season�s championship at William Hill, putting him ahead of Truex (4/1), Busch (5/1) and Larson (6/1) at the top of the board.